Give your car the best premium grade chamois for superior drying and shining! The best quality chamois come from England. This one is no different. It couldn’t possibly be any softer or gentler to all surfaces. It is unsurpassed in drying and shining capabilities—windows, your car’s interior and exterior surfaces, around the house, you name it. They’re durable, washable and functional for dozens of uses. To extend the life of your chamois, you’ll want to initiate it by washing it in warm water with mild soap (the same if it gets soiled) to remove all excess oils that are used and accumulate during the tanning process. Always allow chamois to dry naturally, out of direct sunlight, and store in a sealed plastic bag or airtight container—if possible, your wife will love this, in your refrigerator. I keep mine in my mini in the garage. My overly-friendly neighbor stopped by one afternoon while I was in the garage organizing, to see what I was working on and to help himself to the contents of my fridge. The look of confusion and dismay on his face was priceless as he surveyed the four or five chamois—one in a crisper, a few in separate plastic bags, and one in a bread bag—but nary a beer, which was undoubtedly what he was looking for. Genuine chamois, such as this one, are 100% natural leather, tanned using cod oil, which gives it the softness and its leather smell. If you like the smell and feel of real leather, you won’t be happy with a synthetic. Prince of Wales Chamois come in a variety of sizes, from 2.5 square feet, to 3.5 square feet, to the 4.5 square feet of superb, high end leather. The 4.5 version is obviously the most popular for its size—sufficient for any job. Chamois are meant to be used without cleaning solutions or chemicals. 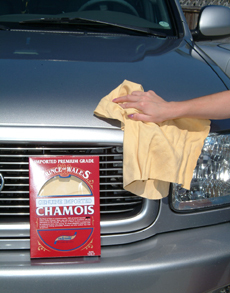 If you use it for polishing and drying only, and care for it correctly, your chamois may outlast you. Chamois & Towel Wringer If you’d like to avoid wet, dripping towels or chamois hanging all over your garage, check out the Chamois & Towel Wringer. It’s the solution to keeping things neat and tidy. It also extends the life of your drying towels, and gets chamois back to drying in no time. It’s a great addition to any garage! Prince of Wales Chamois 4.5 Sq. Ft.
Griots Garage Chamois Cleaner 16 oz.